At least 46 people, most of them Iraqi pilgrims, were killed and more than 120 others wounded Saturday in Damascus in twin bombings that targeted a religious shrine. Images from the scene showed several wrecked tourist buses, with eyeglasses, shoes, cellphones and a mangled wheelchair scattered in the bloodstained wreckage. There was no immediate claim of responsibility. 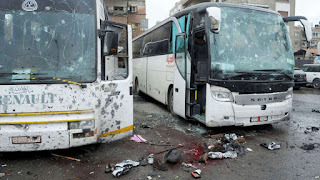 However, Islamic State militants and other Sunni extremists have carried out similar attacks in the past against Shi'ite shrines in Syria and neighboring Iraq, including a double bombing last June that killed 12 people at a shrine in a Damascus suburb. Syrian authorities and monitors cited conflicting reports about the cause of the blasts. State television said bombs had been planted in the Syrian capital's Bab al-Saghir cemetery, which includes a shrine where Shi'ites venerate some of the early figures of their faith. The Shi'ite militant group Hezbollah, however, said suicide bombers carried explosives to the shrine, which marks one of the seven gates to the Old City of Damascus. All accounts agreed that the two explosions were detonated 10 to 15 minutes apart, which meant many casualties occurred when the crowds rushed to the blast scene to offer help and the second bomb exploded. In a separate development Saturday, Syrian President Bashar al-Assad vowed that his army would continue an offensive against Islamic State all the way to the extremists' de facto capital, Raqqa, even as a rival, U.S.-coordinated Kurdish force prepares an all-out assault on the same extremist stronghold. Assad spoke in an interview aired Saturday by Hong Kong-based satellite Phoenix television. Asked about the deployment of 500 U.S. troops last week at Manbij, Assad said that "any foreign troops coming to Syria without our invitation ... are invaders." Three rival anti-jihadist armies are now converging on the area northwest of Raqqa: a Turkish force and allied Sunni fighters; Assad's largely Shi'ite army, backed by Russia and Shi'ite militias that Iran supplies; and the U.S.-backed Kurdish force known as the Syrian Democratic Forces (SDF). The close proximity of those forces has prompted warnings that long-standing antipathy between Turkey and Kurdish fighters in the SDF could boil over into conflict ahead of any combined assault on Raqqa. The Pentagon described the U.S. deployment this week as a precautionary move aimed at keeping the rival forces in and near Manbij from attacking each other.